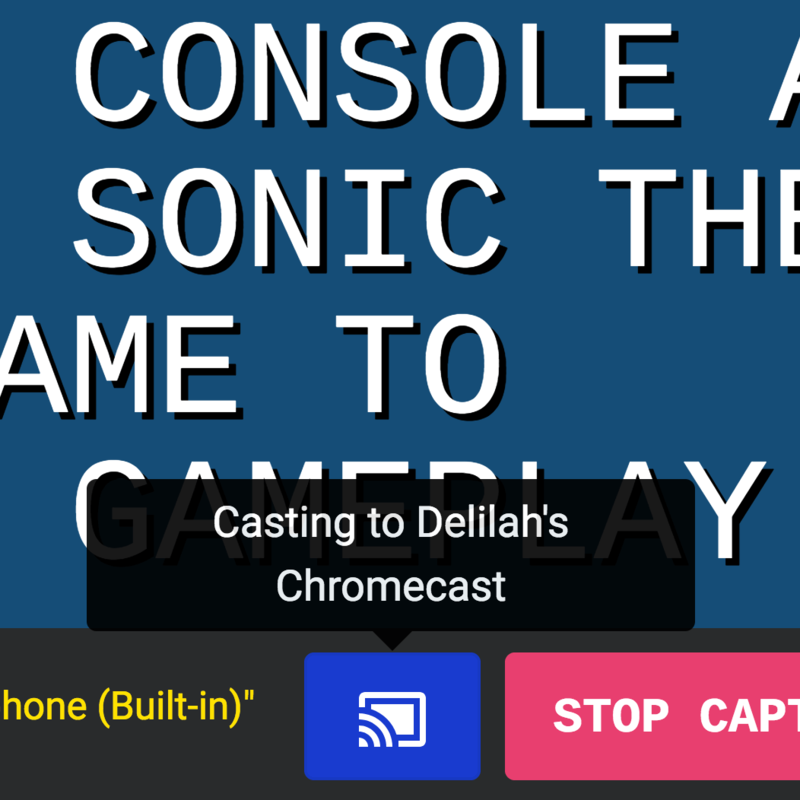 Cast to a TV with Chromecast - Cast captions to a Chromecast or Cast-enabled device (like Android TV). Export and restore settings - Export and restore Web Captioner settings between computers. Autostart - A way to start captioning automatically from a link or bookmark. 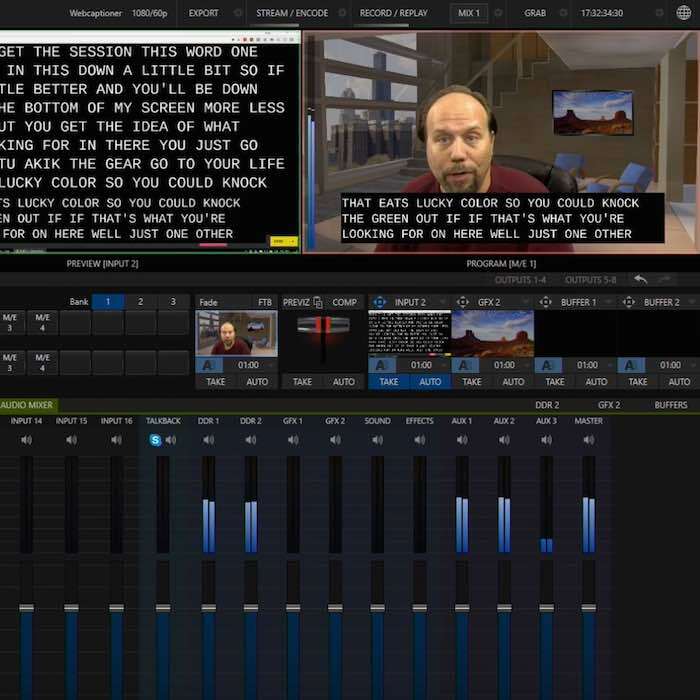 Larger screen layout - An option for larger captioning controls. Webhooks (Preview) - A way to integrate your own application. Have a Chromecast? Now you can cast your live captions directly to a TV. 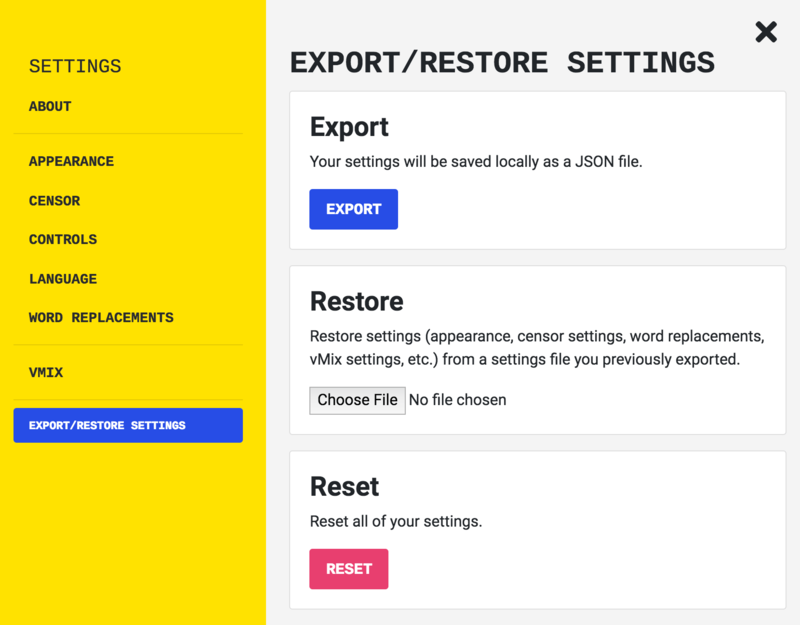 You can now export settings to a JSON file and restore settings using that file. There's also an option to clear out all of Web Captioner's settings. If you want a way to quickly start captioning, you can now visit webcaptioner.com/autostart. If you haven’t given Web Captioner permission to use your microphone yet, you’ll have to do that once. An option for larger captioning controls makes it easier to start/stop captioning, clear the transcript, and save to a file on a touch screen. This mode also enables certain one-button keyboard shortcuts. 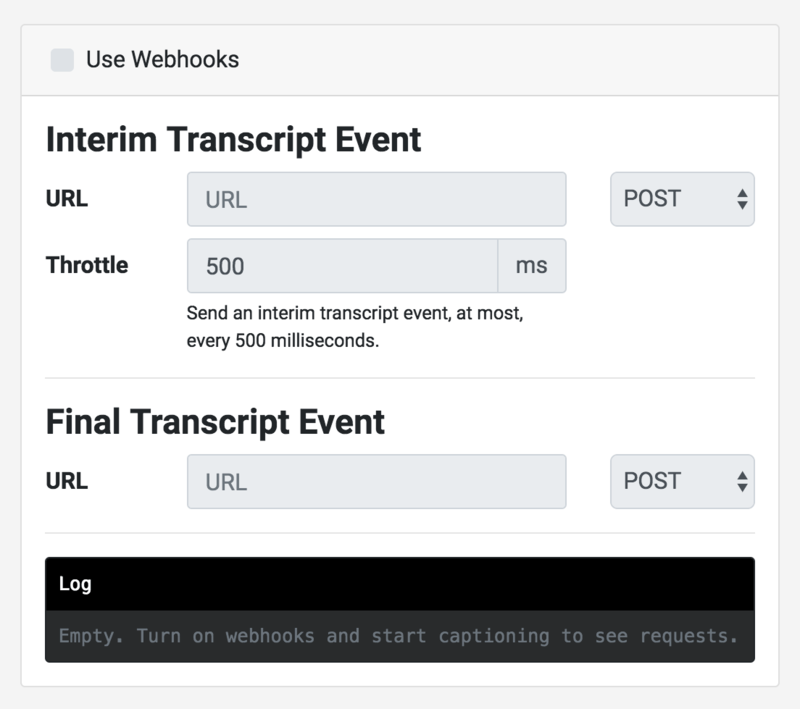 Webhooks allows you to receive real-time HTTP notifications of captioning events in your application. Events are sent client-side from your browser. This feature's still in progress, so it may change in the future. Let me know how it works for you! Fixed an issue where appearance settings may not be set properly when opening a new captioning window. Resolved an issue where vMix connection status may have been incorrect when loading Web Captioner. Fixed an issue where the spoken language setting would not be saved. Fixed issue where captions couldn’t be saved when using the large screen layout. When using Opera or Chromium, you’ll now get the same browser incompatibility screen that other non-Chrome users were presented, and you won’t be given the option to start captioning. Read more about browser compatibility in Web Captioner. When you begin casting or start new window mode, the current transcript up to that point will now be visible immediately in the new window or on the Chromecast. 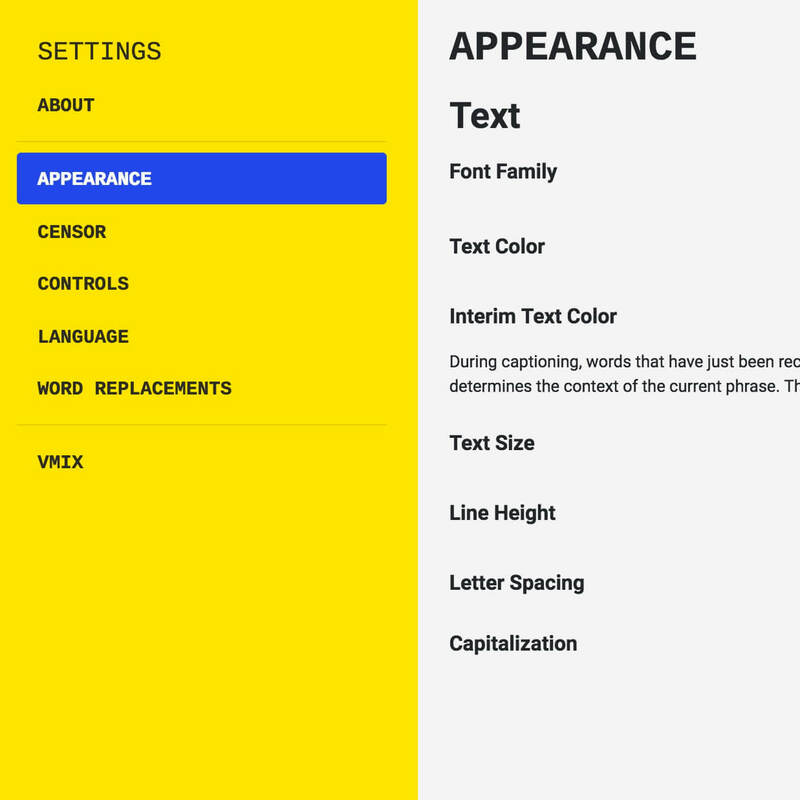 Updated Settings > Language with a new interface language setting and made behind-the-scenes changes to prepare for Web Captioner interface localizations. Fixed an issue where captions would not display when casting to a Chromecast receiver. Resolved an issue where the transcript would occasionally be misaligned when leaving the settings screen. Fixed an issue where appearance settings would not be used when casting to a Chromecast receiver. Resolved an issue where the navigation bar would be a wrong color when casting to a Chromecast receiver. Feedback - Vote up the best ideas! Have ideas for Web Captioner? Check out the feedback page, where you can post your ideas for making Web Captioner better, vote up other ideas, and see the status of ideas that I’m working on implementing. The Web Captioner Users Group on Facebook is the best place to get help with Web Captioner and see how others are using it. You can also like Web Captioner on Facebook to be notified of new updates and upcoming features.